A few weeks ago my Twitter timeline was buzzing with photos and tweets from the Jewelry Show in Las Vegas. Some lucky staffers at Brides Magazine and Martha Stewart Weddings were touring the trade show floor trying on ring after gorgeous ring. I kept up with their tweets and noticed a sweetly romantic trend, rose gold. I have been crushing on rose gold for a little while now. If the gift of jewelry could be any more romantic, rose gold makes it so. Softer than platinum and yellow gold it has a sweet, vintage aesthetic. My rings are platinum, but their is something blush worthy about these styles. 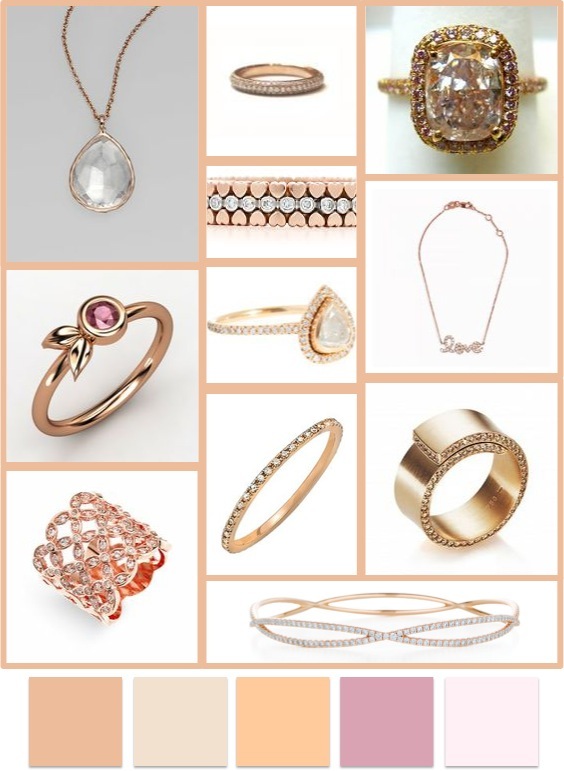 Would you be blushing for rose gold jewelry? Let me know in the comments! This entry was posted in Accessories, Her Closet, Her Weddings + Events, Jewelry, Wedding Fashion and tagged engagement ring, jewelry trends, pink diamonds, pink gold, rose gold, rose gold engagement ring, rose gold wedding ring, rosegold, wedding ring. Bookmark the permalink.